Work for GoDaddy Email Marketing? Learning about GoDaddy Email Marketing? "A great alternative in the world of email marketing"
What I like the most is the usability of the platform, so it is very easy to configure everything you need, the quality of the service is excellent and it has very good functions in terms of email marketing, we can make business emails and manage them all in one place, in addition to sending mass emails to our entire list of contacts and thus make promotions easily. "Decent WYSIWYG editor with some downsides"
GoDaddy's WYSIWYG editor is great, striking a nice balance between ease and flexibility. For background, I've used iContact, Constant Contact, GoDaddy and Mailchimp. I find mass mail sites either box you in with pre-fab, static templates (Mailchimp) or add so many customization options that it complicated the email crafting (iContact). GoDaddy hits a happy medium. Outside of the email content editor, GoDaddy Email's workflow isn't great. It mimics the iContact method of having you choose a list and subject line as the very last step before sending - almost as an afterthought. Your subject and audience are the two most crucial email items, arguably more important than the email content itself. I much prefer Mailchimp's process where you determine your audience and subject first, then review them at the end on a preflight screen. I also find that GoDaddy emails end up in spam folders more often than those sent by iContact or Mailchimp. I would include GoDaddy in the suite of mass email vendors you compare, as prices and systems are constantly changing. Plus, it's always good to have at least one backup mass email vendor, so you still have a conduit to send company messages if your main method has a performance or protocol issue that blocks you (system downtime, billing, lists, etc). I have used GoDaddy as an option to send mass emails and track engagement. It provides the usual email vendor benefits of keeping me informed of opens, bounces, etc. as well as keeping my lists organized and a record of messages sent (which is important for audits). I think one of the things that I like most about Google Email Marketing is mostly that it's very affordable. Not only is this affordable I think this is very good at integrating with the rest of your site. I think integration is one of the most important things for me. at times I find there is a lot of clicking to get into the system. You sign in and then get to your program and then click to where you want to be. There should be a better way to not have to go on a treasure hunt each time you want to sign in to the program. I think that I would recommend this product if you really want to try and use everything in one spot, but if you really want to branch out this will really be up to you. The way that everything is in one place is what really I am trying to solve. I have my database, my website and my domains all in one place. I dont like having to go to 3 to 5 different websites just to get what I want accomplished. The reporting is actually pretty good as well. I really like being able to see all the reports. The Best is the ease of use and How it seemly goes with all that comes with your Go daddy Suite,Also the range of things you can do. I dislike the fact its pretty hands on and not many options for automation with out extra fees. "GODaddy is a highly profitable email Marketing"
It helped us to streamline our process of advertising. It does not have a trial offer like other email marketing service providers. I would suggest it to all. Its a good product to reach our to the people you wanna target. It helped us to reach out the target audience. Which has lead to more business it simplification processes on methods to better target and gain customers. "GoDaddy Email Marketing Providing marketing solutions for Businesses"
GoDaddy Does not use cPanel in for their hosting so I port back to another company. I love that I can send emails through another platform other than my business database. It is a little more expensive than I’d rather pay. I get to reach my customers easier with a marketing message. "Seamless integration with your website"
If you currently use or are considering email marketing of your websites this product will fill the bill. Keeps us on top of our email marketing and pinpoints areas where improvement can be needed as well as successes seen. if you are looking for a basic starter user solution for your email marketing needs this solution is a good starter product but if you are going to scale your business you will want to look to the competition and something a bit more robust to fulfill your needs. Unless GoDaddy can make some changes they will be behind the pack in this space. "We Use GoDaddy for Webhosting and Email Marketing"
Our company has used GoDaddy for webhosting for years as well as the email marketing. My company was previously using constant contact but it didn't have the customization as well as the amount of recipients you can use on GoDaddy. The price is high on the email marketing but I believe it is worth it. With our previous program we used it was more expensive and we had a small cap on how many mass emails we could send out through each email blast. We use GoDaddy to get our clients informed of company and real estate updates. "The best product I’ve ever used"
"It's a Go for Go Daddy"
Easy to use platform for communication. The name is kind of weird of the company. It doesn't make me think of a marketing platform. I initially had a family member purchase a membership for my personal business that was a start up. I have since cancelled my membership with nothing against go daddy. I found it was not needed for the volume of business I was receiving. 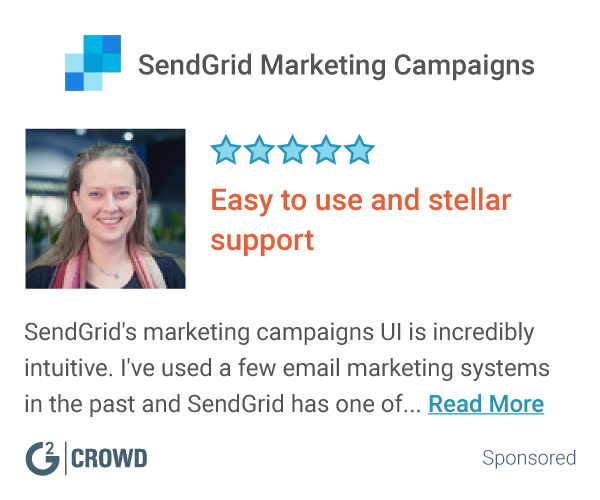 "Exceptional Automation Tool for E-mail Marketing "
I appreciate the usability and ways marketing has advanced through such an easy to use tool. I don't dislike anything about this product, keeps me ill-informed about how to entice my customer base. Keep with this tool, its very easy to learn and incorporate within a fast moving business. No particular problems that need to be resolved, found it to be exceptionally beneficial for operating at a fast pace. "Go daddy email marketing personal recap "
Easy and flawless to use, best marketing tool/website host out there! "Go Daddy email marketing review"
the ease of use was very helpful in creating my campaigns. GoDaddy user support helps make up for the lack of functionality in the product. versatility when making cheap domains in addition to domain auction program, it is not very expensive, it is a pleasant experience and the page is very simple. Go Daddy has many different templates that make it easy to send professional emails to many different types of people. I don’t have anything to say about disliking this application. GoDaddy email marketing ultimately helps with the marketing process with the many different types of templates available. "Go daddy for easy website creation"
The cost can be lowered for more usage . "GoDaddy Email Marketing really helped my small business!" Limited options for template designs, would like more variety. Easy user interface, gets the job done. It can have some bugs here and there. It overall is a good product. Marketing emails for clients, newsletters. * We monitor all GoDaddy Email Marketing reviews to prevent fraudulent reviews and keep review quality high. We do not post reviews by company employees or direct competitors. Validated reviews require the user to submit a screenshot of the product containing their user ID, in order to verify a user is an actual user of the product. Hi there! Are you looking to implement a solution like GoDaddy Email Marketing?